Page revised in December 2015. In July 1857 Ferdinand Gregorovius, a German historian best known for his studies on medieval Rome, visited Subiaco to look at some documents in the library of the Benedictine monastery of S. Scolastica. In the following year a German paper published Subiaco das älteste Benediktinerkloster des Abendlandes, a short account describing this monastery and that of that of S. Benedetto (aka Sacro Speco), which is located nearby (you can read the English translation by Dorothea Roberts in Bill Thayer's Web Site). Gregorovius provided his readers with a detailed historical background of the two monasteries. 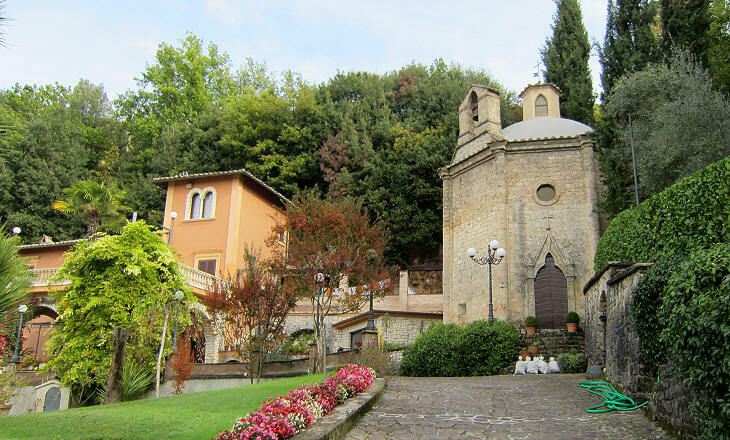 S. Scolastica is within walking distance (2 miles) of Subiaco and along the road there are several chapels which contribute to preparing the traveller for the visit of the monastery. S. Maria della Febbre (Fever) is an elegant Renaissance building which is now part of a private property; its hexagonal shape is typical of small churches built to celebrate cases of miraculous recovery from sickness; they are more frequently named S. Maria della Salute (Health). After S. Maria della Febbre the road starts to rise along the eastern side of a gorge; one can hear the murmur of the Aniene River, but not see it because of the rich vegetation; by looking backwards one can see Subiaco with all the houses grouped around the castle. The road replaces an ancient path which ran inside the grounds of the villa built by Emperor Nero. St. Maurus was one of the first disciples of St. Benedict and he is known for having rescued another monk who had fallen into a pond. Ruins of Nero's villa can be seen along the road, but they fail to convey a proper idea of its size and appearance; the buildings were spread over a vast area which exceeded that of Villa Adriana. The water of the Aniene River was exploited to create artificial waterfalls, fountains and the three lakes after which Subiaco (Sublaqueum) is named. According to Pliny Nero, who was born in a villa by the sea in sunny Antium, decided to build a villa in a rather cold region because Charmis, a doctor from today's Marseille, theorized the advantages of taking cold baths. 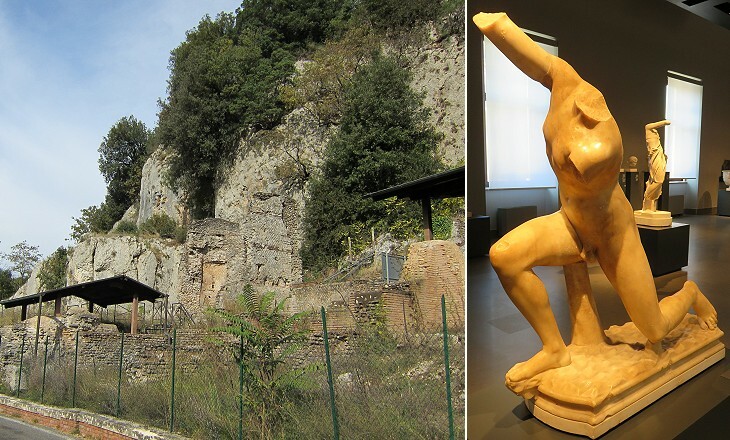 Nero however left his new villa and never returned there after a lightning strike hit a building where he was staying. At a turn of the road S. Scolastica suddenly appears on the edge of a ravine; notwithstanding the bell tower it does not call to mind a site of peace, but rather a fortress. 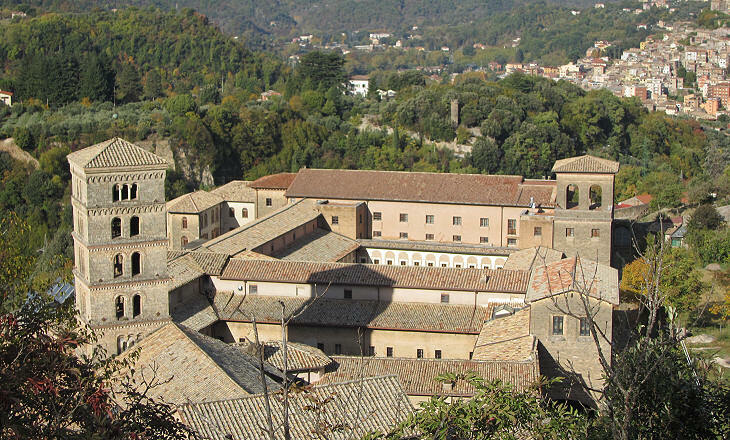 It is one of the twelve monasteries built by St. Benedict for his disciples. The oldest part of the monastery is that near the bell tower, whereas the long building in the left part of the image is a XVIIth century addition. 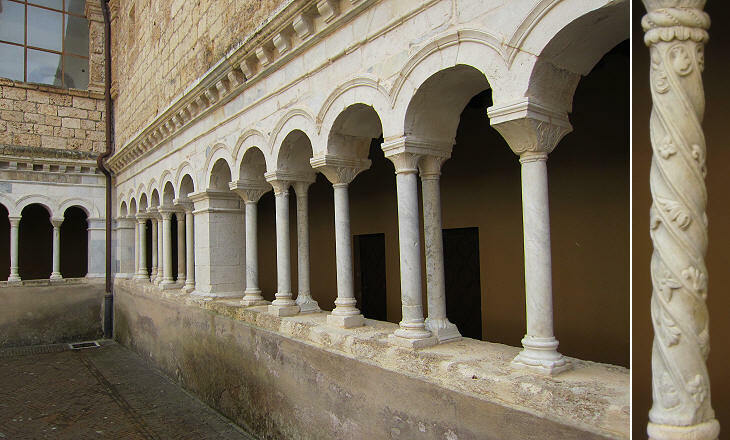 S. Scolastica is the only one of the twelve monasteries which was rebuilt after having been sacked by the Saracens in the IXth century; the Saracens had a permanent settlement south of Terracina and from there they made raids into the interior of the peninsula. 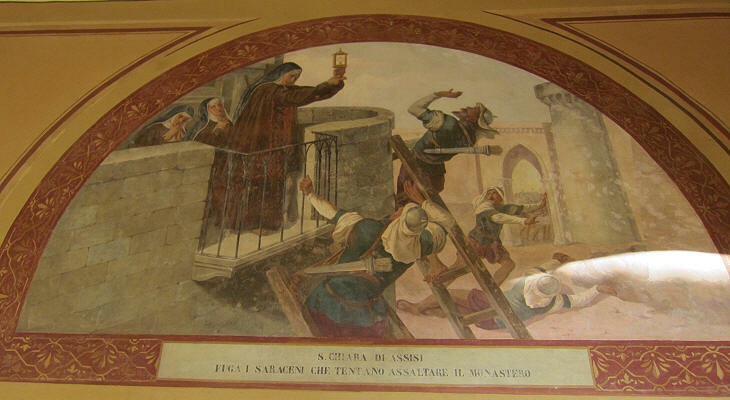 Saracinesco, a small town near Subiaco, was most likely founded by Saracens; after the Norman conquest of Sicily in the XIth century many Muslims were relocated to southern Italy; they were known for being skilled archers and they fought for Emperor Frederick II. In origin S. Scolastica was dedicated to St. Sylvester, who was pope at the time of Emperor Constantine. 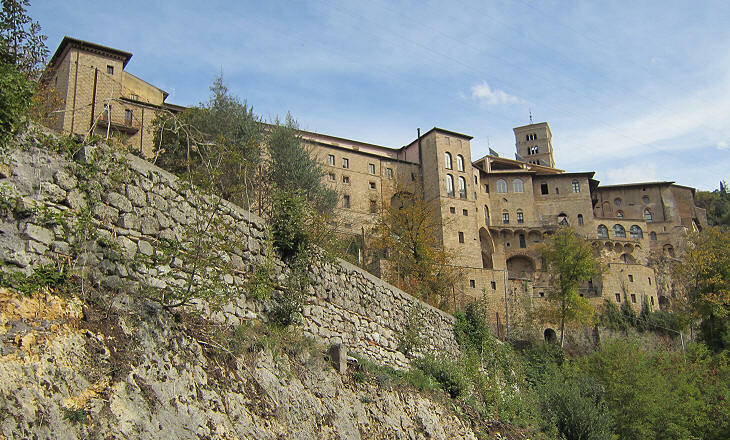 Later on the monastery was dedicated to Benedict and Scolastica, his twin sister; in the XIth century the abbots built a detached section of the monastery on Sacro Speco, the site where Benedict lived as a hermit; this section became known as S. Benedetto whereas the main monastery was called S. Scolastica. The monastery is a complex of buildings which includes three cloisters, a church, a hostel for pilgrims and a library which contains copies of the first books printed in Italy. They were printed in 1465 by Arnold Pannartz and Conrad Schweynheim, two German ecclesiastics who set a printing press in the monastery. In the last page of their books they wrote Deo Gratias (Thanks God) the traditional words by which the amanuenses celebrated the completion of their work. They did not get along too well with the monks however and a few years later they moved their printing press to Palazzo Massimi in Rome. Because of its long history S. Scolastica is a conglomeration of very different styles; the tall Romanesque bell tower was built in the XIth century and it replaced a previous tower; the church was built in the Xth century, but it was redesigned in Gothic style in the XIVth century. In 1769 the interior was entirely renovated by Giacomo Quarenghi, an architect best known for the many palaces he designed at St. Petersburg. 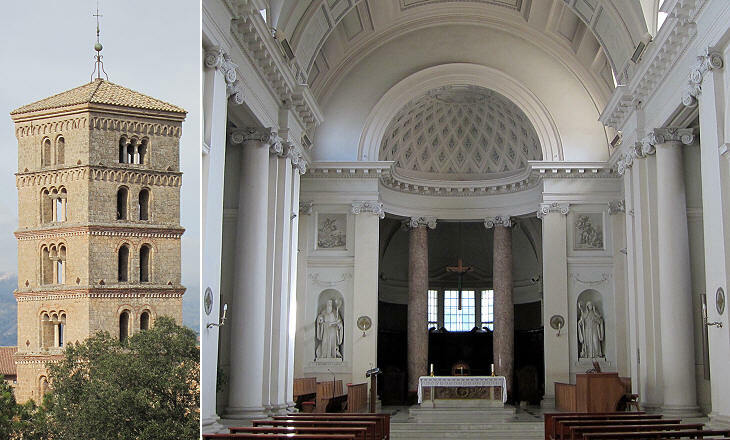 Quarenghi was an admirer of Andrea Palladio and he spent several years in Rome studying the ancient buildings: the decoration of the niche of the apse is reminiscent of that of Tempio di Venere e Roma. 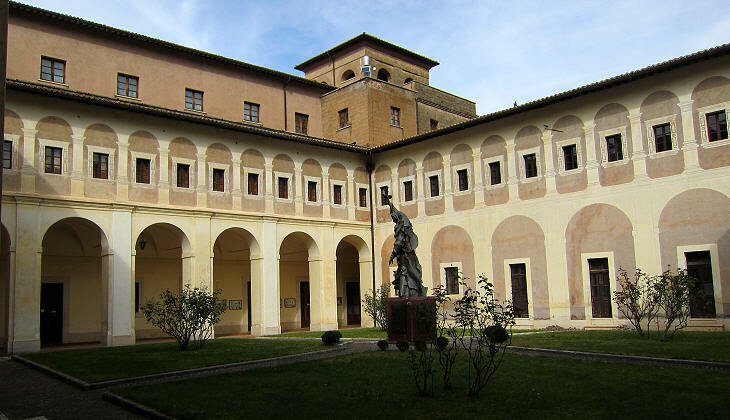 When Gregorovius saw the oldest cloister of S. Scolastica he was rather disappointed as he compared it with that of S. Paolo fuori le Mura which was designed at the same time as that of S. Scolastica. 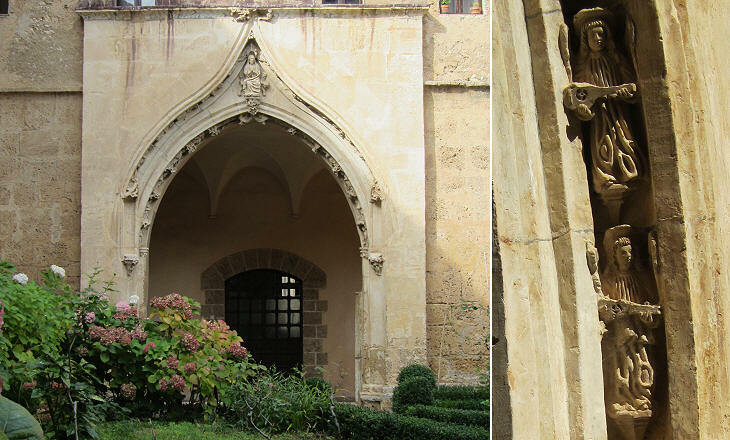 Three generations of the Cosma family worked at the construction of the cloister; the design is very elegant, but the decoration with the exception of a few columns is not very elaborate. In 1362 Abbot Bartholomew III, who was appointed at the end of a period of turmoil, invited foreign monks to settle at S. Scolastica; many of them were Germans, and for more than a century the majority of the monks were foreigners; this had an influence on the style of the second cloister where a large portal was designed following patterns of Catalan cathedrals. The third cloister was built over a long period of time (1580-1689) and it was largely reconstructed after it had been damaged by bombs on May 23, 1944. Move to Sacro Speco (S. Benedetto) or return to Subiaco. Click here to see the monasteries in the 1905 paintings by Alberto Pisa. Click here to visit the official website of the Benedictine monasteries of Subiaco. 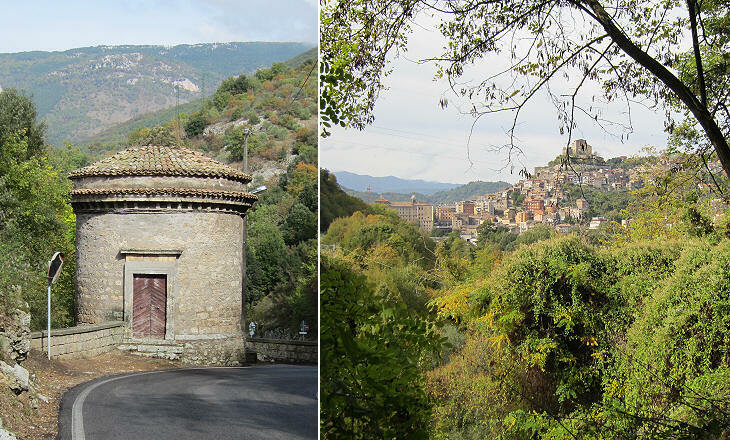 Small towns near Subiaco: Cervara, Rocca Canterano, Trevi and Filettino. Introductory page on Ferdinand Gregorovius. Roman Campagna: Colonna and Zagarolo. Palestrina, Cave, Genazzano, Olevano, Paliano and Anagni. The Ernici Mountains: Ferentino and Alatri; Fiuggi (Anticoli di Campagna); Piglio and Acuto. The Volsci Mountains: Valmontone, Segni, Carpineto, Norma and Cori. On the Latin shores: Anzio; Nettuno and Torre Astura. Circe's Cape: Terracina and San Felice. The Orsini Castle in Bracciano.